Keep buyers engaged and increase sales with the Vendio Gallery. The Vendio Gallery can increase your sales by up to 18% by showcasing your other eBay items within each of your listing pages. Our intelligent cross-promotion engine displays the most relevant and closely related products display first. Use the Traffic Booster edition to specify the presentation order of your listings. The Vendio Gallery engages buyers by allowing them to continue to shop without leaving the page they're on and provides you the opportunity to cross-sell your items. The Vendio Gallery is mobile responsive and complies with eBay's active content policy. The Vendio Gallery is customizable, so it won't compete with your listing theme or branding requirements. 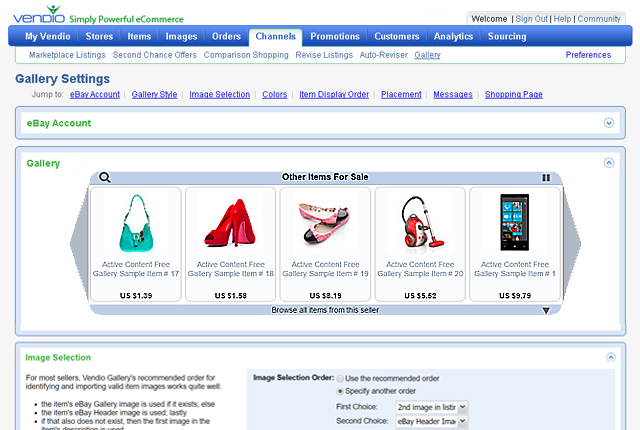 It can also be installed off of eBay, on virtually any website or blog where you have HTML control. Set up your Vendio Gallery in minutes, and start selling more! Cross-sell: Showcase all your eBay products and improve your cross-sell lift. Relevancy: Intelligently cross-promote products relevant to your listing. eBay Active Content Compliant App: It is mobile responsive and active content-free. Customization: Choose from unlimited color combinations.